MANILA, Philippines (CNS) — Cardinal Luis Antonio Tagle of Manila warned against fanaticism in his homily during a Mass to usher in the feast of the Black Nazarene Jan. 9. The cardinal told thousands of people who attended the midnight celebration to distinguish “fanatics” from “devotees,” reported ucanews.com. “What is the meaning of devotion? Every year, it is being put into question. Isn’t it fanaticism?” he said. The feast of Manila’s Black Nazarene, which attracts millions of people, celebrates the “solemn transfer” of the image to a church in Manila’s Quiapo district from a chapel in the old walled city. 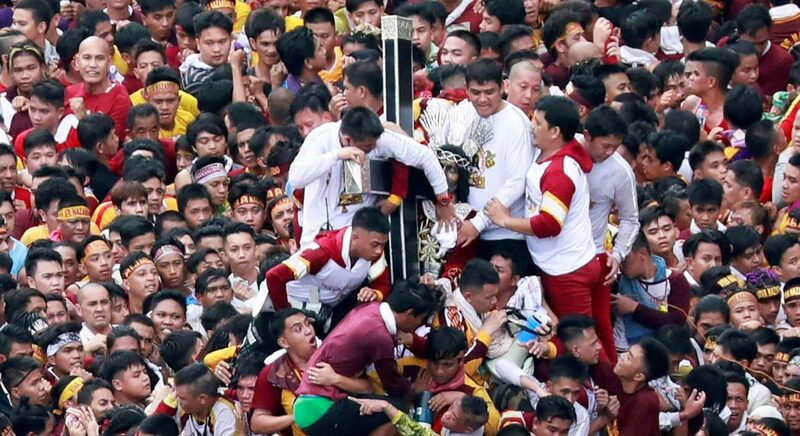 Tens of thousands of predominantly male devotees frantically push and shove their way to touch a dark wooden statue of Jesus Christ during the procession. They believe participation in the procession can atone for their sins, ucanews.com reported. Cardinal Tagle said only a true devotee can understand the significance of the celebration. He said that unlike fanatics, devotees love the Lord unconditionally. The cardinal said a devotee will always be loyal because of love. He said devotees are united with the one they love, be it in suffering, happiness and sickness. The prelate reminded Catholics that being a Black Nazarene devotee is not only for a day or for only the feast. “Devotion is a daily act. … In every kind of love, loyalty and union, it must be daily,” he said.